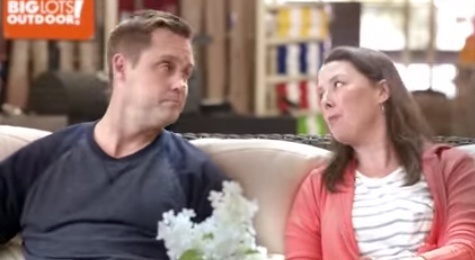 The Big Lots Couple: Real. Devotedly Edgy. When a client has a great product, our job is easier by half. The good news we got from Big Lots: Their new patio furniture is truly built to last. No flimsy one-year-and-done sets here – this patio stuff is the real-deal, and they’ve got the warranties to prove it. So, we needed to tell a “quality” story. The challenge was making that true tale of durability compelling. Our approach? Cue the comedians. We tapped our improv creatives to take the lead on finding a husband-wife voice that was real, relatable and edgy funny. A couple that could celebrate the happy, dysfunctional reality of life and say the stuff people think about the future but don’t often say. That meant leaving behind most of what we see on the family sitcoms and look more toward a Judd Apatow This-Is-40-and-Bridesmaids type of vibe. We decided our couple shares more than love, they really like each other, which is what allows them to play a game that tests the whole for better or for worse thing. Because, c’mon, the couple that can joke about what may lie ahead have got to be the couple most likely to survive it. We wrote a ton of lines. The aim was to write as close to the edge as possible, even step over it a few times. Then we cast 2 comedic improvisors and let them go rogue between takes. The result? A campaign that we think is edgy, fresh, and makes you know Big Lots Outdoor furniture will be with you for the long haul.